Today I want to share with you today the secrets on how to become a professional sports bettor. Many people bet on sports for the entertainment, but some like me makes a living off sports betting. Since the 1990’s I have profited tens of millions of dollars from betting on sports, and to this day I continue to go out and bet hundreds of thousands of dollars every week on my picks as a professional sports bettor. So if you’re interested in becoming a professional sports bettor, here are the most important keys to making that a real possibility. #2: Do not get emotional – To be a successful sports bettor at the professional level, you have to think like a poker player. The poker elites are very emotionally unattached to the outcome of each hand. If you’re someone who toasts and celebrate each time you win, then curls into a sack of misery each time you lose, then you’re setting yourself up for an emotional roller coaster. A professional sports bettor is someone who thinks and wagers mechanically, knowing that at the end of the ride, they’re very likely to end up way ahead. As a professional sports bettor, you have to operate with an almost robotic approach. If you get on an emotional high when you have a big winning day, then you’re setting yourself up for a emotional wreck on the next losing one. As a professional sports bettor, you cannot let yourself fall into this trap of swinging emotions. Imagine an elite investor in the stock market. Do you think that a sophisticated stock investor wakes up each day celebrating each time the market goes up, then falling into a pit of misery each time it goes down? Of course not. Otherwise, they’d be celebrating one minute and then despairing the next – all day long. A professional investor cannot let the emotions affect them based on constant daily swings. As a professional sports bettor, you can see with your own eyes how I operate in a mechanical approach regardless of the daily swings. You’ll see days when I have no emotions after winning tens of thousands. You’ll also see days when I lose tens of thousands and completely shrugs it off. Take a look at the last 4 days for a perfect example. 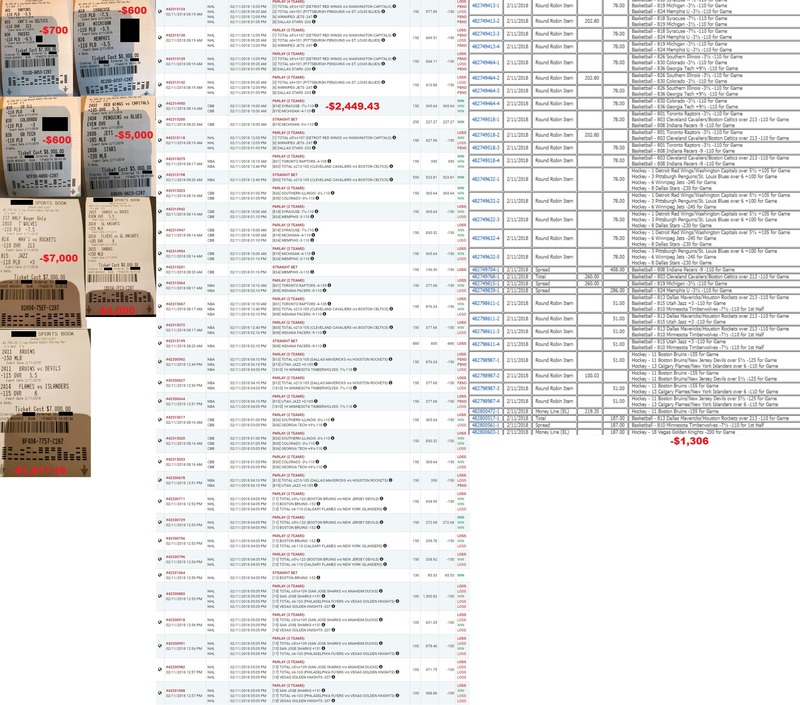 All the results below can be verified at www.TheWhaleTracker.com where all picks are fully documented. Not bad, right? But I remained very emotionally unattached, and continued on with my robotic approach. 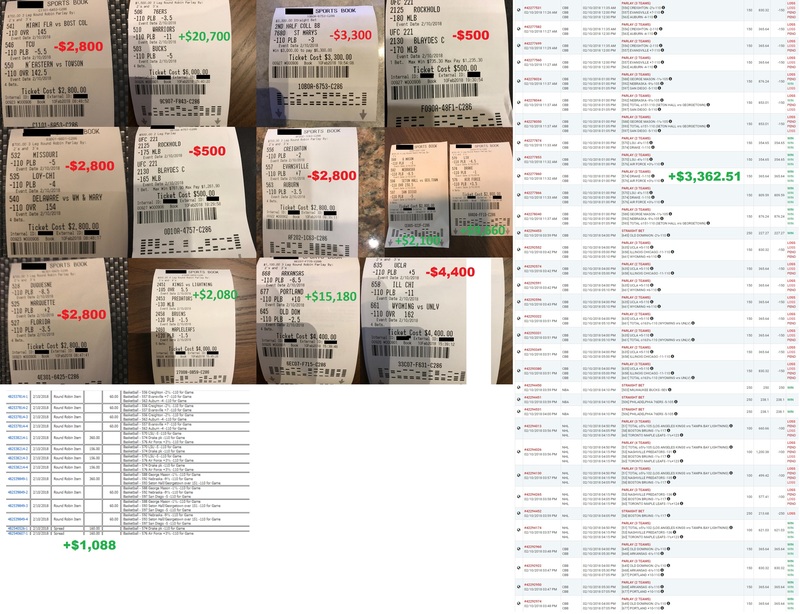 So the next day on Sunday, guess what – I ended up losing $23,272.89. That’s a lot of money, but still way less than what I won the day before. But I didn’t despair over losing $23K in a day. I just sailed on to the next day, knowing with near certainty that at the end of the ride, I’ll end up ahead. So the next day on Sunday, I wagered nearly $40K and ended up cashing out $58,107.87 for a net profit of $19,746.87 in one single day. That’s nearly $20,000 I won in just one day of betting on sports. Once again, none of this affected me emotionally. 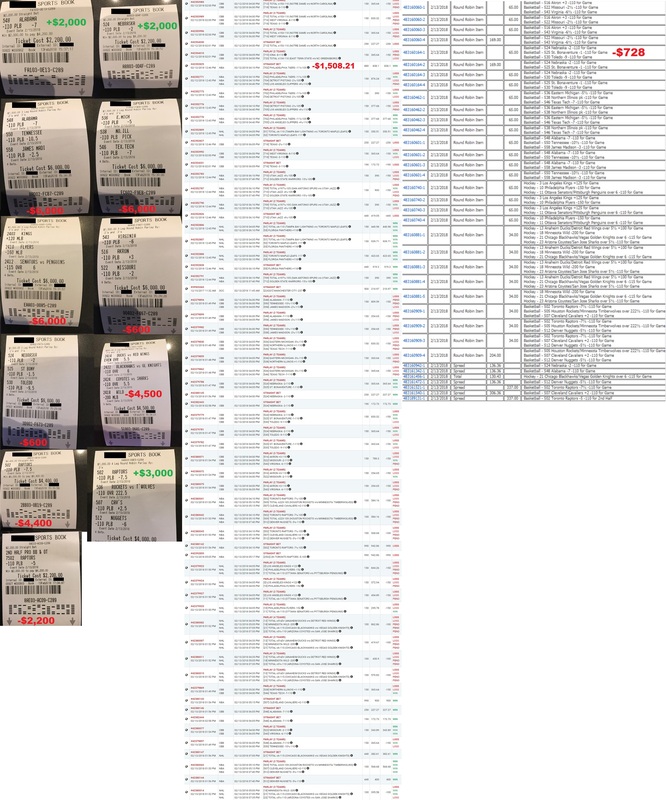 The day after, which was yesterday, I lost $25,536.21 after betting $66,847 on my picks. Once again, I show no emotions after losing tens of thousands of dollars in a day, the same way how I never showed any emotions when I won tens of thousands in a day. So after all this ups and downs, winning tens of thousands in a day and giving back tens of thousands on the next, I still ended up ahead by $5,208.28 after the last 4 days of roller coaster. To be a professional sports bettor, you cannot let the emotional swings bother you. Just know in the back of your head that by riding out these waves over time, you can end up way ahead at the end of each ride. #3: Bet on the right picks – The third key to winning becoming a professional sports bettor is to bet on the right picks. Well, I’ve made it a lot easier for you by sharing all of my picks with you. I constantly analyzes the patterns and zero in on what I determine to be the most likely outcomes of every game, and I share my findings with you every day in the premium membership. I encourage you to lock in your premium membership today, and you can start tailing one of the biggest and winningest professional sports bettors – ever! I will do all the heavy lifting for you. All you have to do is just wager on the same exact picks that I bet on myself at the professional level, and see what kind of a difference I can make for you and your financial life at the end of the ride.